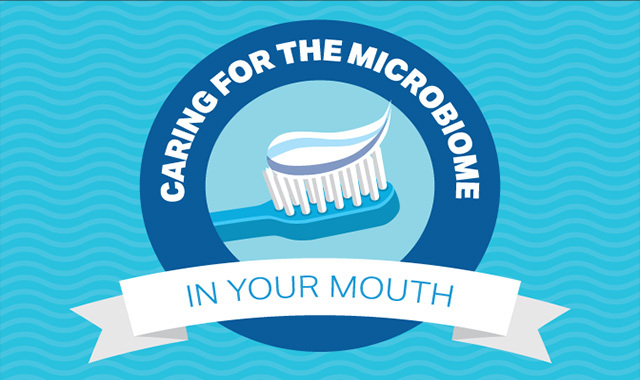 Caring for the Microbiome in Your Mouth #infographic ~ Visualistan '+g+"
We can all agree taking care of our teeth and gums is important. After all, we only get one set of permanent choppers and we need to keep them healthy. The question is, what’s the best way to care for them? The prevailing theory for most of the last century was that gum disease and cavities were caused by bacteria, and we needed to banish the bacteria to prevent oral disease. However, in the last few years, dentistry and medicine, in general, are undergoing a paradigm shift. We’re increasingly understanding that we have a diverse and organized microbiome in our mouths, which consists of 700 or more different species of bacteria.1 The majority of microorganisms in our mouths are harmless, and many are actually helpful. Research suggests they do crucial jobs, such as regulating the body’s blood pressure, helping the immune system function better, and aiding the body in synthesizing and excreting vitamins. However, to complicate matters, microorganisms aren’t actually good or bad; they can be beneficial or harmful depending on the conditions. The body’s microbiome is much like a forest ecosystem, where organisms work symbiotically to maintain a state of balance.